Bridges of this size.... require the highest effort of mechanical and constructive skill. Mr. Stephenson's magnificent Britannia bridge displays one method of crossing wide spans. The present work of Mr. Brunel's is another mode, and shows, as might have been expected, his peculiarly original and bold conception, accompanied by extraordinary economy, by arranging his materials in the form of a large suspended truss, and attaching the roadway to suspension chains kept in s state of rigidity by vertical trusses or struts inserted between the chains, and a circular wrought- iron tube, spanning the river, 309 feet in length. Left: Closer view of the bridge (detail of the engraving above). Right: Cross section of the bridge. Note that the tubes run across the top, while the trains run on the open deck. This is not a tubular bridge in the sense that those at Conwy and Menai Strait are. Plan of the tubular bridge. 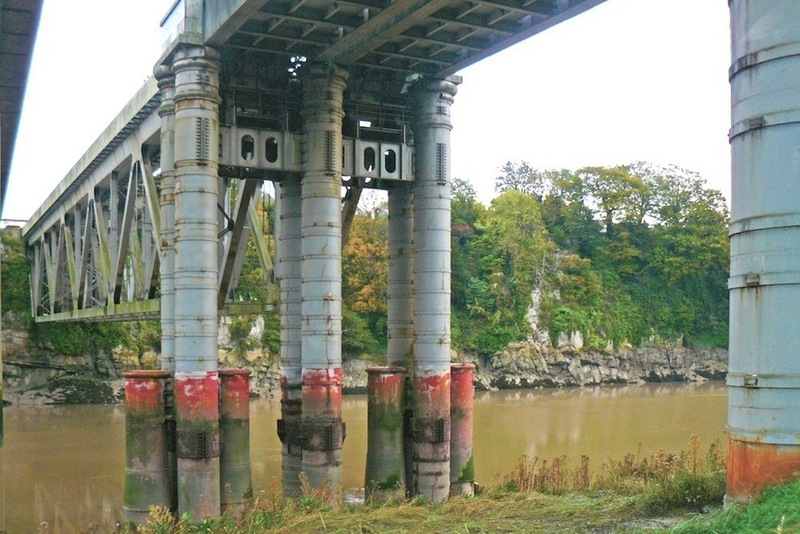 Cast iron piers still remaining at Chepstow. As seen in the Conwy Bridge and the Britannia Bridge over the Menai Strait for the North Wales Railway, and as suggested by the ILN account, the expert on tubular bridges was Robert Stephenson. But Brunel, being much engaged with the South Wales Railway, was responsible for this one, as for other bridges on this line, such as the Loughor Viaduct at Swansea (not the same type of bridge as the Chepstow one, but a low structure on wooden trestles, which lost the last of its original bridgework only recently, in 2013). 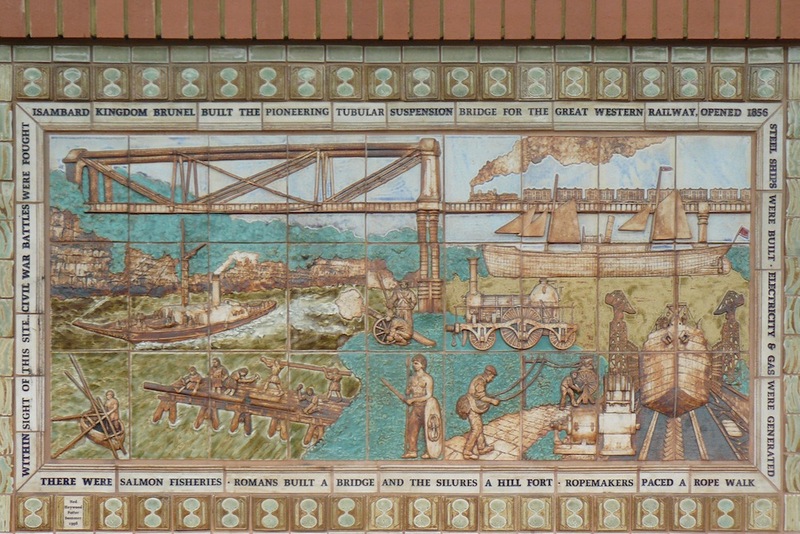 The Chepstow bridge itself, celebrated on the ceramic plaque shown below, appears to be a prototype for his lenticular truss bridge at Saltash. "Isambard Kingdom Brunel built the pioneering tubular suspension bridge for the Great Western Railway, opened in 1856." Plaque in a local (Tesco) car park, celebrating the bridge and other aspects of Chepstow's local history. The date 1856 in the top right-hand corner refers to the completion of the whole railway line. Christopher, John, and Campbell McCutcheon. The Railways of Wales (based on Bradshaw's Guide). Stroud: Amberley, 2015. “South Wales Railway. 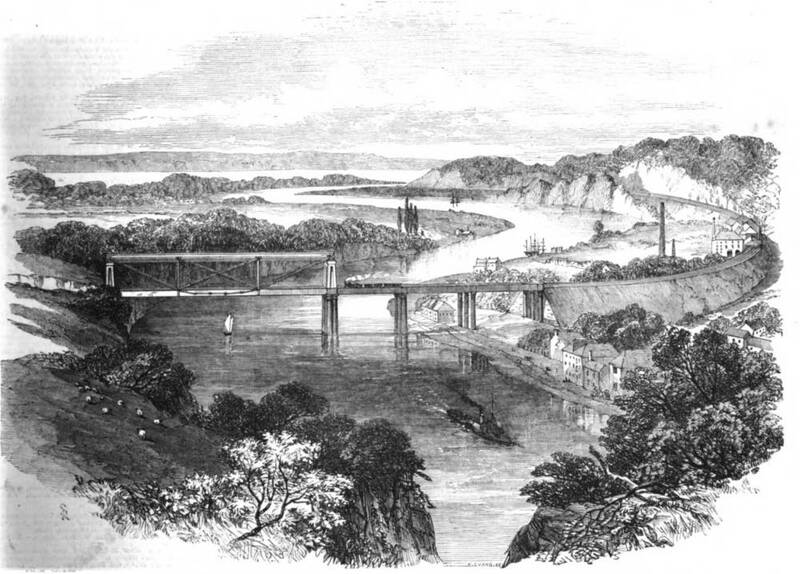 — Opening of the Chepstow Bridge.” Illustrated London News. 24 July 1852: 61-62. Hathi Trust Digital Library version of a copy in the University of Chicago Library. Web. 9 December 2015.